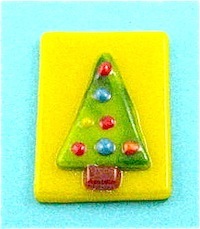 A fused glass Christmas tree made from a few pieces of fusing glass and contour fused in a glass kiln. This simply designed Christmas ornament can be made in a number of ways. With or without a base plate or a small base plate cut to the shape of the tree. The color of the base plate can be changed or simply left clear. Fine white glass frit can be scattered over tree to give the appearance of snow. Sprinkle silver or gold mica over tree for a sparkly finish. The sample tree is very small but it can be easily increased to a much larger size. Colored glass for tree decorations. Base glass 1 7/8" x 1 3/8"
Tree 1 3/8" x 1"
Tree trunk 3/8" x 1/4"
Tree decorations are small pieces of scrap glass. Assemble tree and decorations on base glass. Use small drops of fusing glue or white glue to hold parts in place on base glass. Once the glue has set, put tree on a prepared kiln shelf and place in glass fusing kiln. As this is a small piece of glass, it can be bought up to contour fusing temperature very quickly. The temperature will depend on what brand of fusing glass you are using. Hold for ten minutes and check to see if the corners are nicely rounded and the basic shape has been retained. Do not over fire or the tree will completely fuse and the overall shape will be lost.